These are a mix of multiple games, recolored to sit along side the epic pokemon pattern. Click the images to download the separate PDFs. 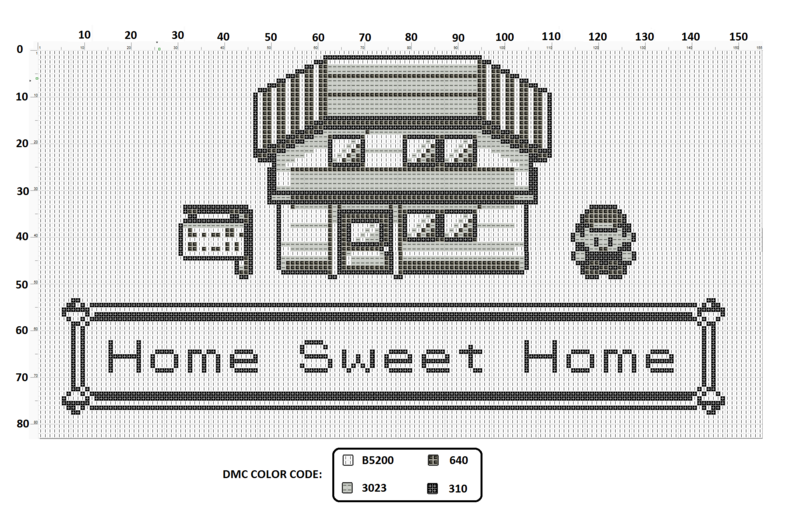 How does a totally free pokemon ‘home sweet home’ cross stitch pattern sound? Three free Pokemon cross stitch patterns. I’m spoiling you, aren’t I? I love Pokémon, nowhere near as much as I love Digimon but that might well be another post. My boyfriend Alex also loves Pokémon, probably more than I do and probably more than the non-nerd society thinks a 28-year old man should. As I’m such a bitchin’ girlfriend, I decided to create a Pokémon cross stitch for Alex to make up for being a bit cruddy at chores, working all the time and worst of all, dual-screening during Masterchef. So, Project Porygon was born. Before I get started, I must mention that there are some alternatives available, Makibird-Stitching on DeviantArt has created some spiffing patterns that you can download for personal use. You can also pay for templates from various etsy stores, but I’m a much bigger fan on investing about 15 minutes to save myself some dolla dolla bill y’all. In my previous post I mentioned how searching for ‘sprites’ through Google images can help you find some really simple cross stitch patterns for beginners. This method can also be used to create your own not-so-simple Pokémon cross stitch patterns. There’s literally a truck-load available. I like this one, and this one. Visit one of these links, and find an angle of a Pokémon that appeals to you. I chose the one in the triangle below. Generation 4 was a strong one for porygon. Right click, or drag and drop, to save the sprite to your desktop. Most of the sprites available are PNGs, the next program we’re going to use can’t cope with transparent backgrounds so it’s important to convert the file in order to have a white background. If you’re on a Mac, you can open the file in Preview, select ‘Duplicate’ and then change the file format to JPG. If you’re on a PC, you can do the same in MS Paint by opening the file and selecting ‘Save As’ . Again, you need to choose ‘JPG’ from the drop-down. You could also use these opportunities to trim any excess white space off the image – this will make your pattern easier in the long run. This site is so cool considering it’s totally free. Visit this link and select ‘Advanced’ from the primary navigation at the top of the page. Now, click ‘Select Image’ and upload your shiny new JPG. There’s a field to add the maximum number of thread colours. Be prepared to play around with this as each Pokémon is different. I find 5-8 is enough. Pick coloured boxes or symbols, or both, I like coloured boxes but each to their own. Then simply select ‘Make Pattern’ et voilà! A beautiful pattern that you can download as a PDF, print or save it to a cloud drive for use on the road. Porygon cross stitch final piece, still working out what to do with it. And that’s it. Let me know in the comments how you got on with creating your own pattern! After playing with a miniature arcade cabinet that tested my small plastic canvas creations, I wondered just how small I could go. I settled on trying the smallest scale possible, make one cross stitch one meter (or 1:500 scale if you’re interested). I’ve been throwing a lot of ideas around following a trip to Japan in late 2014, and I started by making a torii gate. I left it unfinished and when I went back I started putting peices together and thinking ‘oh, maybe a tree would look good’, etc. It eventually evolved from there, and it turned into the Pokemon Ecruteak City. Ecruteak City is actually different in the anime, manga, and games, and so this is a combination of a series of images and video to make the most generalised city. The bell tower (tin tower originally) is the main feature of the city, designed in the traditional way, with accurate angles, which has 9 floors with purple roofs, complete with a golden stand on top, which is meant to draw the legendary Pokemon Ho-oh to it. The opposite side sits the ill-fated burnt tower, with only 2/3 floors left, where the legendary Lugia used to reside. Both are on raised land masses to add to their height, which is shown in most itterations of the city. You can also find a Pokemon center, gym, PokeMart, zen garden, two red bridges, a pagoda, cherry tree, a blank house tile (which has always featured in both games and anime, I have no idea why), and trees surrounding the whole city. It’s 3.5″ by 3.5″, and 4″ tall. Arkani over at the SpriteStitch forums posted this for the Pokemon 20th anniversary, I just had to stitch it. However I wanted to play with the limited palette of Pokemon yellow and so recoloured it. This year I’ve entered both the mega and mini Sprite Stitch craft swaps! This is a gift for my mega partner Citrusoda, featuring some of her most favourite things! She really wanted something Pokemon OR a quote. Well, how about both? She also mentioned loving Japanese sayings, Gengar specifically, and loving red black and purple. This is what a came up with, featuring the Japanese saying “wake from death and return to life” on a Japanese inspired block print cross stitch. A return to pokemon! I’ve always loved typography (and have always been useless at it), but recent Portal lemon rant stitches I’ve seen have made me take stock. Maybe I could do something like that? And what better than the motto of Team Rocket from Pokemon Series 1 & 2. To extend our reach to the starts above! I’d like to thank the fantastic members of SpriteStitch for spell checking it for me. Where would I be without you guys? I’ve seen a few stitches and art work similar to this in the past, and wanted to do my own. As a result I found a rather boring pattern online and decided to hide pokemon in there. I’ve been meaning to do another red blue 3D image for a while, and after finding some great pixel art on PixelBlock I couldn’t help myself.